But the great potential of artificial intelligence shall become fully clear when considering its possible applications to drug discovery. It seems an era ago since the Human Genome Project was completed in 2003; since then, sequencing capabilities and softwares for data analysis rapidly established themselves as the new paradigm for drug discovery thanks to the increasing availability of IT technologies and the institutional and governmental support to big data analytics’ policies. The annual growth rate of the market of artificial intelligence for healthcare applications has been recently estimated by Global Market Insights to be 40% CAGR (Compounded Average Growth Rate) per year up to 2024, starting from a value on $ 750 million in 2016. According to the report, China should be the faster growing country (45% CAGR), followed by the United States (35%), while Great Britain is the leading country in Europe. Barriers to entry this new industrial sector are represented by the very high initial costs and the possible negative impacts on human jobs, that will be increasingly replaced by automation. Future might become difficult for companies still pursuing a more traditional business model, according to a study from EY: should they not adopt a more innovative and AI-based model, more than 75% of organisations in the life science sector currently listed in the Fortune 500 are expected to exit such list by 2023. But the great potential of artificial intelligence shall become fully clear when considering its possible applications to drug discovery. It seems an era ago since the Human Genome Project was completed in 2003; since then, sequencing capabilities and softwares for data analysis rapidly established themselves as the new paradigm for drug discovery thanks to the increasing availability of IT technologies and the institutional and governmental support to big data analytics’ policies. These enhanced analytical capabilities are crucial to fully elaborate the enormous quantity of pre-clinical and clinical data already available both within the pharmaceutical industry and public research centres in order to extract new possible targets for drug development, or to test already available medicines for activity in new indications. A recent example is represented by the publication of the final results of the Pan-Cancer Atlas project, a collaborative effort run by “The Cancer Genome Atlas” consortium which took ten years to fully characterise more than 11.000 specimens of tumors from the genomic point of view. The result are 33 new families of tumors, reclassified according to cells of origin and molecular similarity, the type of oncogenic process and its progression and the analysis of the tumor signaling pathways. In the UK, a consortium of pharmaceutical companies led by Regeneron (and including also AbbVie, Alnylam, AstraZeneca, Biogen and Pfizer) will afford by 2020 the complete exome sequencing of half million UK’s citizens that voluntary adhered to the UK Biobank providing their biological samples, together with many other health and life style information (see here for more details). These data will allow to gather an extensive picture of the state of health or disease to be used to accelerate the discovery of new medicines. After one year of exclusive use for the six companies of the consortium (each of one contributing to the costs of the project with € 10 million), the sequencing data will be made available also to independent research. Another main field of application of artificial intelligence is expected to be in supporting diagnosis. The medical imaging and diagnosis segment of the AI’s market is also expected to grow 40% CAGR, to surpass $ 2.5 billion by 2024. China should be the country evolving faster in this direction: application of AI to medical diagnosis is the first phase, to be implemented by 2020, of the government’s plan “China’s AI Awakening”. According to MIT Technology reviews, AI should help reduce the impact of the very low number of medical doctors in China (1.5 for every 1.000 inhabitants). 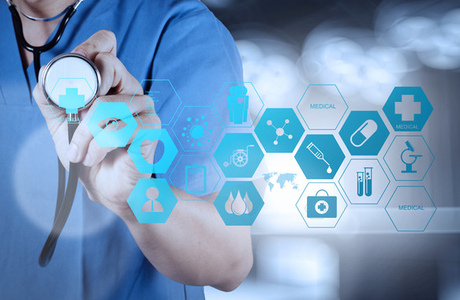 The great capacity of data analytics makes machine learning and deep learning algorithms able to directly learn from the huge amount of diagnostic images stored into clinical repositories. This knowledge will increasingly support the human decision within the diagnostic process. The FDA recently approved OsteoDetect, the first computer-aided detection and diagnosis algorithm that analyses two-dimensional X-ray images for signs of distal radius fracture and marks the location of the fracture on the image. The FDA also approved an AI-based medical device to detect greater than a mild level diabetic retinopathy in adults affected by diabetes. Similar applications are expected to be soon available to analyse also images from CT and MRI. The adoption of artificial intelligence is central also to develop new and more patient-centric modalities to ensure provision of healthcare services. Web-based platforms to access such data-driven services should be the key, according to the report of EY, for pharmaceutical, biotech and medtech companies to gain access to the real-world data which are increasingly representing an important pillar of drug development and regulatory evaluation in the post-marketing phase. Platforms of cure might also support a better definition of fair value for certain products or technologies on the basis of their perception by end users, the patient-consumers. The increasing availability of disease-specific platforms, for example focused on diabetes, may also contribute to keep better under control the increasing costs of public health expenditure. Apps for smart devices might also represent a new tool to improve compliance to therapy, even if the results of the MediSAFE-PB trial recently published in JAMA Internal Medicine are not encouraging. The 12-weeks long study recruited the 5577 participants with uncontrolled hypertension through an online platform, 412 of which met the inclusion criteria and were instructed to download and use the Medisafe app, which provides reminder alerts, adherence reports and optional peer support. According to the authors, at the end of the study patients randomised to use the smartphone app had a small improvement in the self-reported medication adherence but no change in systolic blood pressure compared with controls. An not encouraging result to start with, even if the approach is patient-friendly and should thus encourage adherence to treatment and reporting. You can read some experts’ opinions on the unexpected outcomes of the Medisafe study in the article published by MedCity News. Logistics is another field where artificial intelligence may greatly support the activities of the entire pharmaceutical supply chain. DHL, for example, run together with Accenture a pilot project to evaluate the impact of the blockchain technology on the pharmaceutical supply chain. This technology shall not only support a more efficient management of contracts and payments, but it is also expected to greatly enhance the security level in shipments of medicinal products, thus helping in the prevention of counterfeiting. The serialisation prototype developed under the pilot included six nodes in different geographic areas to track medicinal products along the entire supply chain. The technology can handle more than 7 billion serial numbers and 1.500 transactions per second, according to the study. India is playing a leading role in the implementation of blockchain technologies to better manage several different processes. The south-eastern Indian State Andhra Pradesh is at the center of the experimentation of the new model, being the first state in India to adopt blockchain for governance. In 2016, the local government launched the project to build the fintech city Visakhapatnam (“Vizag”), a port city that, according to Forbes, is emerging as the country’s blockchain hub. Vizag will also host the development center of Shivom, a blockchain-enabled healthcare platform that aims to be the largest unique genomic and healthcare research hub on the planet. The company signed a Memorandum of Understanding with the Government of Andhra Pradesh in order to sequencing and analysing the genome of its 50 million inhabitants as a measure to revamp the State’s healthcare system and provide more personalised care. The project might represent the first step toward a new model of healthcare, which would fully exploit the predictive power of genetic data to shift healthcare systems from being reactive toward a more preventive approach. “Our partnership with Shivom explores the possibilities of providing an efficient way of diagnostic services to patients of Andhra Pradesh by maintaining the privacy of the individual data through blockchain technologies,” said J A Chowdary, IT Advisor to Chief Minister, Government of Andhra Pradesh. Pharmacies are them too called to face the new challenges coming from the extensive adoption of artificial intelligence. According to The Royal Pharmaceutical Society, just selling medicines is no more a vital business model, and pharmacists should focus to enter the new patient-centric model of cure providing new services to costumers and helping them to achieve compliance to treatment or enhance their life style. Pharmacists should then transform into true health managers, according to The Medical Futurist, that support the patient along all steps of its trip into the disease. This includes also the possibility to directly 3D-printing medicines on demand within the pharmacy, or provide some low level consultation services from remote with the help of AI algorithms (see also the article published by Forbes).